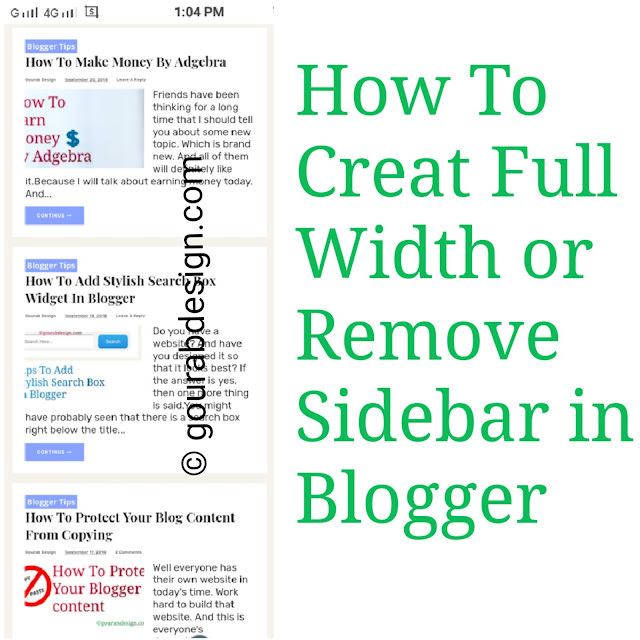 Hi friend Today I will teach you how to remove sidebar from blogger. And this post can be shown in full width. Simply Simple Process.You write a new post every day. But the same post in your site is not fully visible. Meaning the sidebar is in place. Because of which the post becomes half. The whole is not complete. This is the only problem with your template problem.Because there is a sidebar in the blogger. But nowadays, the Without Sidebar is a professional website. If you want to show your every article in full width. If you want to delete the sidebar, then do the tip I give to him carefully.It is seo friendly too. This will make your visitor feel better to read the whole post. And due to full width, you will get more clicks.Which means your income will go up too much. I will tell you 3 ways today, by which you can do this easily.And one thing to do this, you alone are enough. There is no need for anyone's help. I'm going to tell a very simple way. > First you login your dashboard. >> Template/theme >> Edit html >> simply click this edit html button. Now press the ctrl+f. Search </style> tag. Now save it by clicking on the Save Theme theme. Visit your site. And refresh. Then see the sidebar has disappeared.And your content is going to show up well on the entire blog. The second process is similar to a up process. But this only changes the code. And it has to be replaced in another place. > Go to the blogger dashboard . >> Click the down there Template option. >> Then click Edit html. >See, an empty search box will open. Typing it </b:skin> tag. ✓Now copy all the code below here 👇. And paste the </b:skin> tag above it. Whenever you write a new post to do this, you have to paste a html code before writing the post or in the last. But remember that this code is pested in the HTML TAB. Otherwise it will not work properly.